Persecuted Prisonersʹ Solidarity Committee (PPSC) condemns the continued repression on activists and groups associated with peopleʹs struggles in Jharkhand by the police and administration. Damodar Turi, a member of the Central Committee of Visthapan Virodhi Jan Vikas Andolan (VVIVA), was arrested in the evening on 15" February 2018 from Ranchi. He was arrested after he walked out of a public programme organised by a joint front in Jharkhand called Loktantr Bachao Manch (LBM). The Manch has been formed by various organizations in Jharkhand in the face of the many undemocratic measures of the Jharkhand government, including the recent banning of a registered trade union, Mazdoor Sangathan Samiti (MSS). The LBM programme drew attention to the anti-people measures of the BJP government in Jharkhand including starvation related deaths following the compulsory use of Adhaar for availing PDS services, the banning of MSS, and the fake encounter of Motilal Baske in June 2017. MSS marking 100 years of Bolshevik Revolution in Giridih. MSS has been banned thereafter in December 2017 with several of its members facing arrest and its offices being raided and shut down by Jharkhand Police. This case at Giridih was registered against 12 members of the MSS and 800 unknown persons. Turi had only participated in the programme. Damodar Turi has been active in Jharkhand for years raising issues related to displacement of adivasis and moolvasis and forcible land acquisition by the government for handing over to corporations. Although he is not a member of MSS, but after the banning of MSS, the police has been attempting to connect him with the Trade Union and has foisted several cases upon him. The DGP of Jharkhand had on 20th December 2017 at a press conference stated that Turi was the main coordinator of the MSS and also has other cases lodged against him. In a statement issued on 22nd December 2017 the VVIVA had clarified that Turi is not a member of the MSS. He had been acquitted by a Court in Ranchi of the false case that was foisted upon him in 2009 wherein he was arrested with alleged ʹnaxalite literatureʹ. Prior to the banning of the MSS he had no case pending against him. But after the banning, he has been named in four FIRs connected to MSS. Apart from provisions of the IPC, these FIRs have also been lodged under draconian anti-people laws like the Unlawful Activities (Prevention) Act, 1967 and the Criminal Law (Amendment) Act, 1908.
years the VVIVA has raised issues including amendments to the Chotanagpur Tenancy Act, 1908 and Santal Parganas Tenancy Act, 1949, against forceful land acquisition for Electro Steel Plant and Jindal Mining Project in Santhal Pargana, and of persons displaced due to the Tenughat power plant, Bokaro steel plant, Tiger Project Betla, and Kutaku Dam. The VVJVA has therefore been on the radar of the Government for long. In April 2017 the Annual Report 2016-17 by the Ministry of Home Affairs, Government of India had, without any basis, termed the VVIVA as a frontal organisation of the CPI (Maoist). And now its activists are being targeted. PPSC condemns the arrest and targeting of activists and groups raising and struggling for peopleʹs issues in Jharkhand. We demand that Damodar Turi be released forthwith and cases registered against him and members of MSS be withdrawn with immediate effect. We strongly condemn the unlawful arrest of Damodar Turi (Central Convenor Committee member of Visthapan Virodhi Jan Vikas Andolan) by Jharakhand Police on 15 February 2018. And demand for immediate release for him. 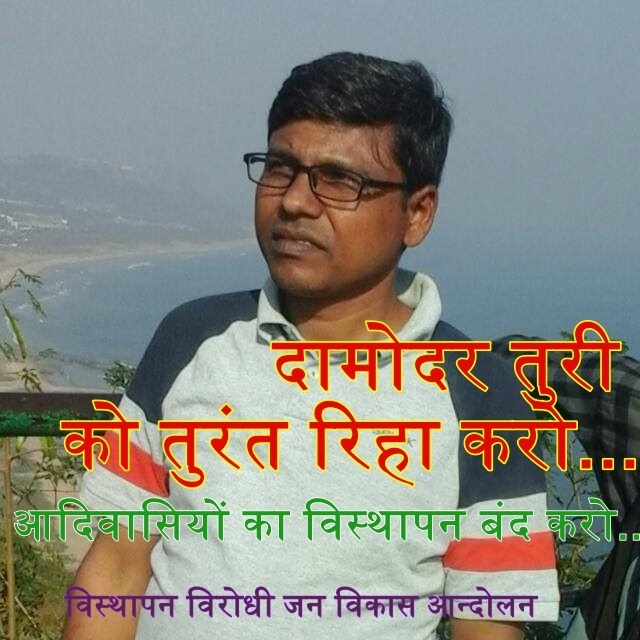 PUDR condemns the arrest of anti-displacement activist and founder member of ʹVisthapan Virodhi Jan Vikas Andolanʹ (VJVA) Damodar Turi, on February 15, 2018 at Ranchi, an hour after the ʹLoktantra Bachao Manchʹ (Save Democracy Forum) organized meeting had ended.